It’s not cardigan weather yet in Central Florida, but I couldn’t resist wearing this new-to-me art sweater. It made me smile and was actually a good choice for the chilly restaurant we visited. And the back of the cardigan advised me it’s “time for an adventure,” so off we went. The cardigan, by brand Sourpuss (similar), was found via Swap.com, an online consignment shop. It was new with tags and under $20, so score. I’m wearing my thrifted AllSaints cropped trousers (sim) and old-but-matchy Anne Klein platform sandals (sim). I skipped the jewelry because this sweater has it all going on. Loving the bluebirds; they look like brilliant tattoos. Kitty and I sharing the view. The back is even more fun that the front. Such a fun and stylish cardigan. Love how you styled it! What a fun sweater, Patti. The blue birds are just like in a fairy tale. I’m always up for a quirky cardigan!! 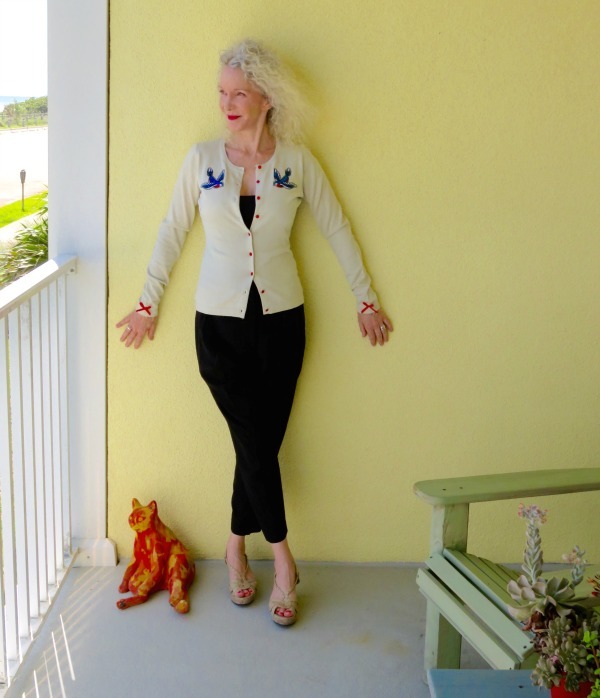 That is such a cute cardigan, Patti – you look fabulous! Great sweater Patti, it really does resemble something you would see on the back of a motorcycle jacket- love it! Thank you for hosting the link up. Be sure to come on over to Shoe and Tell and link up today! Great sweater! It fits you so well. What a funny saying since it seems like something you’d see on a motorcycle jacket instead of a soft yellow sweater. Fun! OMG, this cardi is fabulous! What a good message. I absolutely adore your sweater, it’s so fun and unique! A lovely little cardigan made into a unique piece with pops of colour and a cool graphic! Such a fun sweater… And a great reminder! Glorious birds in your jacket. I don’t deduce I’ve never well-read a touch comparable this before. Hence safe to find a bigwig with aprpaximotely authentic ideas on this subject. I in truth thank you for beginning it. This web site is one thing that’s desirable taking place the internet, someone with somewhat originality. More than one Kobe realist post on this board. And I’m not into fantasy b-ball like so many others here. I’m for championships, not scoring titles. Kevin Garnett is just as hungry, just as old school, if not more, as Kobe. Yet he realizes he can’t do it alone. Something I don’t believe Kobe wants to admit. I’ll post a few interesting stats for those of you have “Kobe is God” syndrome. He’s not the 1st Laker to be a major part of 5 titles, Kareem, Magic, & Mikan did it also. Patti! You look gorgeous, love the pose I love the cardigan, looks like a tattoo on the back of the cardi, very fun and a unique score, love it..
Oh, I thought the front of this cardigan was fabulous, and then you show the back! Such a great find. I am in love with this whole look! What a unique wonderful find. I’m going to check out that site. This cardigan is awesome. Not only are the butterflies on the front so cute, as are the buttons and the red crosses on the sleeves. And of course the back. But above all…. it so shows your perfect figure (in a good and elegant way). Really swell outfit. OMG that is such a lovely and versatile cardigan Patti! What a beautiful cardigan! I love the message on the back! Such a cool cardigan! Love the details and what a steal! Enjoy your adventures in that rather good cardigan.Always good to have interest coming and going. Now that’s what I call a party in the back! What a score – love all the details! Thanks for the link-up! I love the look of your website. I recently built mine and I was looking for some ideas for my site and you gave me a few. May I ask you whether you deovpeled the website by youself? Definite Score!!! That cardigan is one great find. You sound like me, I never go out to eat with out taking along some type of jacket or cardi. I love that unexpected fun graphic on the back of your sweater. And I’m glad you are putting a positive spin on places that have their air-conditioning on high! Love the cardigan, Patting, especially the surprise on the back! It’s perfect for you when the message is so meaningful!! What a great cardigan! Love the cute red detail at the cuffs. Oh Patti, that is indeed a cardigan to have adventures in! I saw the front and thought, oh that’s delightful but then the back – well, let’s just say that sent me to the moon and back! Very cute cardigan, love the bluebirds! Super sweater, Patti…and great inspiration! I’m nearly always sporting a cardigan or jacket year round even though I live in nearly always sunny SoCal. Yours is quite fabulous and a perfect lightweight layer for chilling ‘interior’ temperatures. Thanks for sharing your find and for hosting. Such a great cardigan! I love both the front and the back, and the saying is so true! We should always be ready for an adventure! I am always up for an adventure! Thanks for the fun Patti! Cute cardigan, and the embroidery is fun! I love those Blue Birds too-great find. 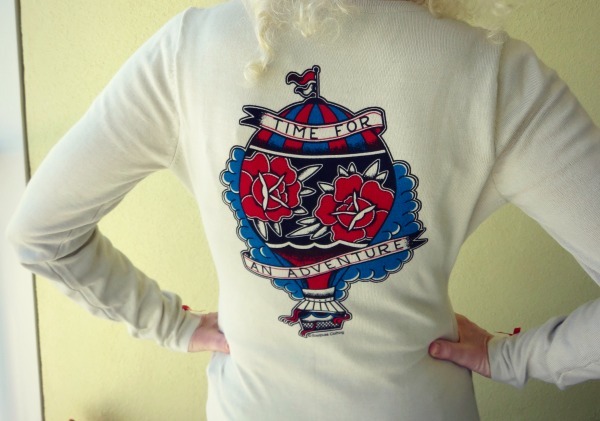 Every day is indeed an adventure and the embroidery on the sweater is simply spectacular! Just makes me smile looking at it and of course your beautiful face!